And Pretty Rose Gold Hardware Accents. Princess Seaming Is Used To Create A Flattering Figure-Skimming Silhouette. Contemporary Fit. Center Back Length: 27". 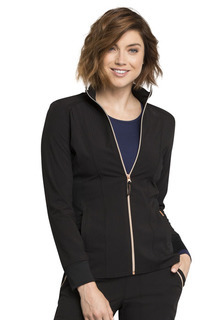 This Elegant Linear Dobby Stretch Fabric And Comfort Jersey Knit Is A Chic Combo Great For A Stylish Medical Professional That Makes A Statement!